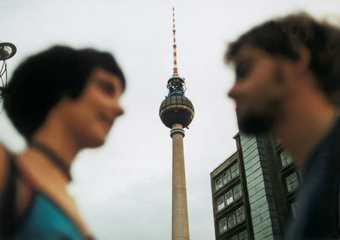 Berlin Alexanderplatz 2000 - within 24 hours various stories rotate between the heights and depths of the square, between the television tower and the subway shafts, between larger and smaller fates, that slowly but surely become entangled. Love, murder, fairy tale, drugs, madness, humor and a lot of music - planet alex moves playfully through various genres. A sparkling firework of ideas that come together in a greater story. With its driving rhythm, the film sketches the seeming loss of orientation of Berlin's city as a pulsating, shimmering network. Uli M Schueppel was born in 1958 in Odenwald. After numerous music clips and experimental films, he studied at the German Film and Television Academy (dffb) in Berlin. His first feature film Nihil (1987) was a big surprise at the Hof Film Days in 1988 and won, among others, the Special Jury Award at the Festival des Ecoles du Cinéma in Montreal (1988) and the 2nd Nino Rota Prize at Trento (1989). He graduated from the dffb in 1990 with the film The Road to God Knows Where, a documentary about Nick Cave & The Bad Seeds. His next feature film, Vaterland (1992), won the OCIC Award in 1993. His other documentary and music films also received recognition at countless international film festivals (Berlin, Rotterdam, Montreal, Edinburgh, New York, Leipzig): The Virus Breaks Through (music documentary, 1992), Frozen Stories (Jahre der Kaelte, 1994), Sid & Nancy - Ex & Pop (1996), The Place (1997), and planet alex (2000), combining, in a rather unusual manner, his experience from music clips, documentary essays and feature films.